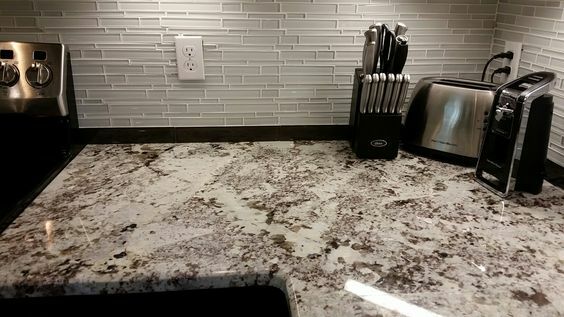 Check out some great Alaska white granite options for your kitchen countertops, perfect for a variety of interior design styles. 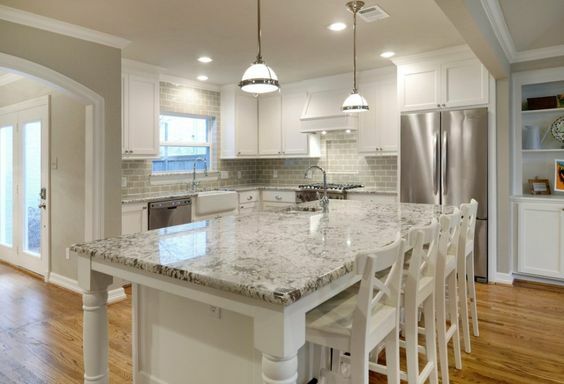 There are many different types of white granite that can be used to define your kitchen countertops, but Alaska white is perhaps one of the most popular and noticeable white granite varieties on the market today. If you are looking for a stunning white granite that will hold up beautifully under all you do in the kitchen, consider installing Alaska white granite. 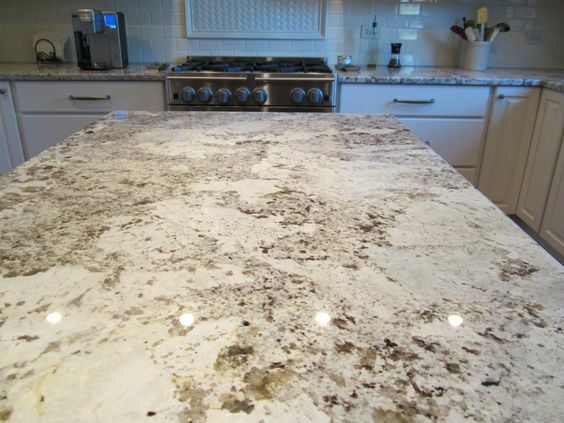 Alaska white granite is a granite variety that comes from Brazil. This particular type of granite is known for the icy, or glacial, look that it has. 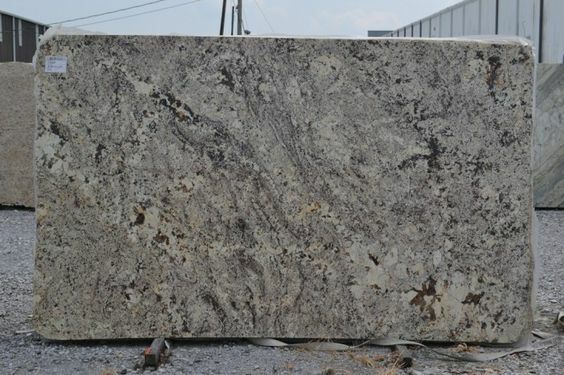 This granite style is white with brown and gray patterns running through it, and is one of the most popular white granite types that people consider for their kitchen countertops. 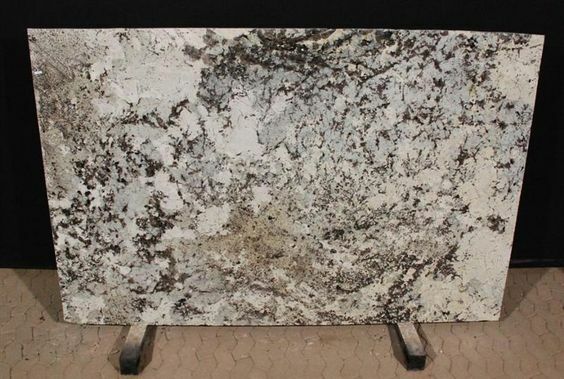 The Alaska white granite bedrock is pure white, but it can contain brown, gray, and other dark elements that give the granite depth and complexity. In addition to scattered spots, darker veins of color run throughout the white granite. The size and frequency of these colorations can vary with different granite pieces, which makes each and every one of your countertops unique from any other granite slab. You don’t just have to stick to countertops with your granite. 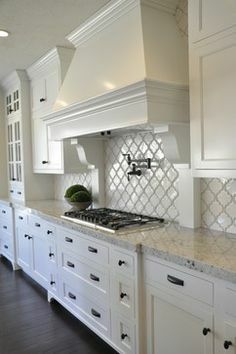 It can also be used as a backsplash, as a border around your kitchen, or as the topping to your kitchen island. Alaska white granite is a common granite countertop option because it can be matched to so many different kinds of interior design. For more monochromatic, contemporary kitchens, Alaska white granite brings in a touch of color that can bring out the dark and light elements in your kitchen. Although the white granite is the most eye-catching aspect of this type of granite, up close reveals more detail that can bring in a complexity to your kitchen counters. This granite variety brings a light tone to your kitchen and can be paired with white or dark cabinet colors, giving you the ability to mix and match your kitchen’s interior design without being stuck in a color rut. If you are looking to make your kitchen feel light, airy, and open, consider pairing this granite with white cabinets. The countertops bring in a color depth, while the white countertops make a room feel open and bright. 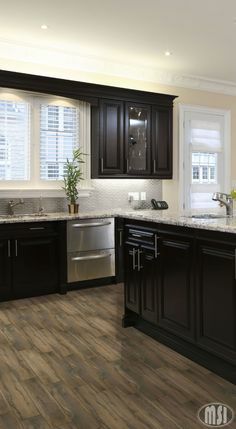 If you want to utilize a darker cabinet color along with the Alaska white granite, the lightness of the granite will help keep your kitchen from feeling too dark. 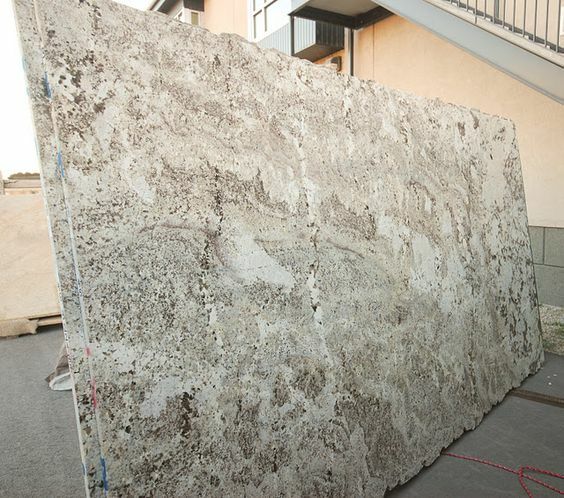 Alaska white granite is one of the most affordable granite varieties available. 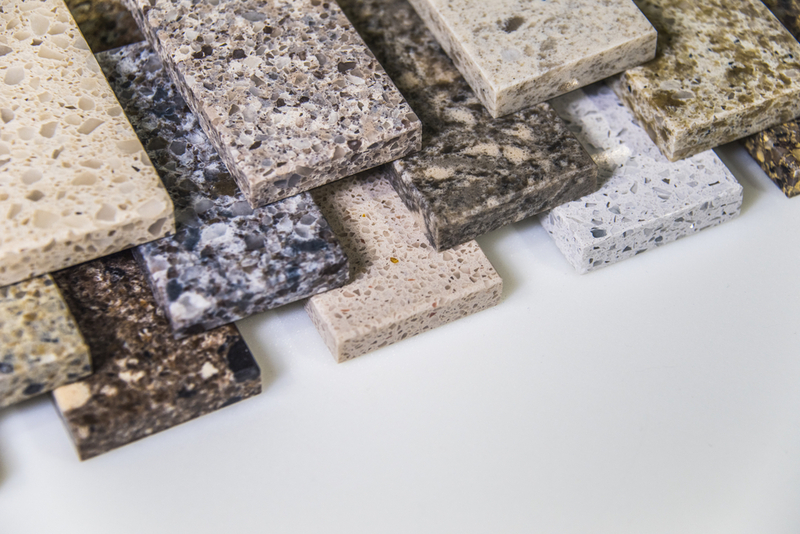 A three-centimeter slab of granite will be approximately $25-35 per square foot, while a two-centimeter slab will cost about $15-20 per square foot. 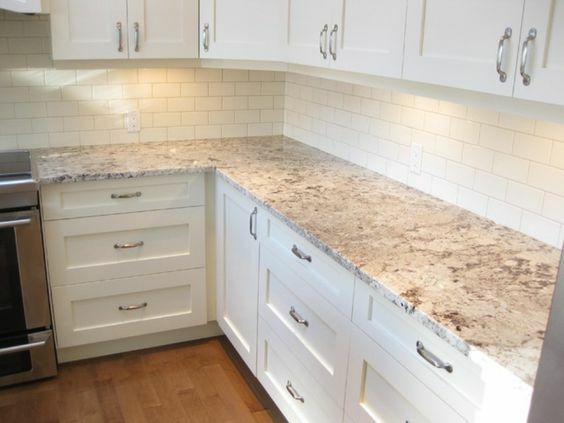 If you are looking to spruce up your kitchen without breaking the bank, installing some hard-wearing Alaska white granite may just do the trick. Here are some examples of Alaska white kitchen surfaces being used to create a variety of interior design styles in the kitchen. A white granite slab can emphasize a modern, contemporary kitchen look. 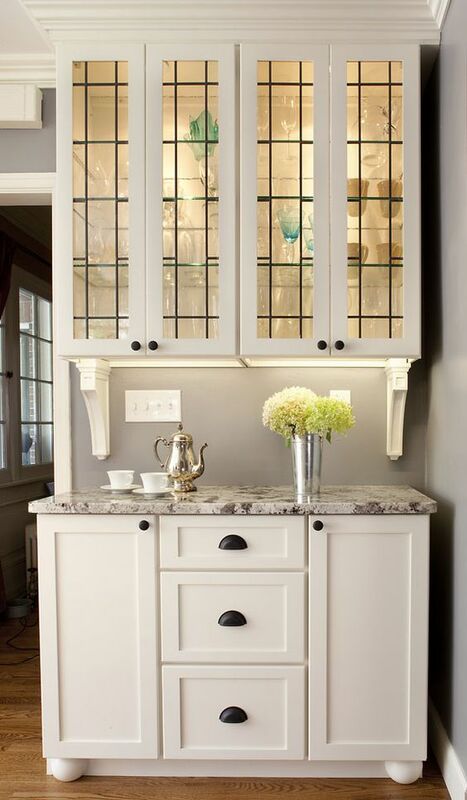 The depth of dark cabinets can be offset with a bright white granite countertop. 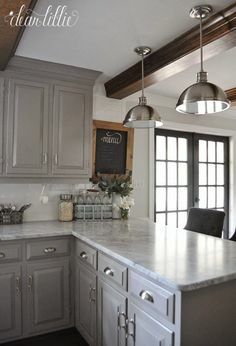 This granite can blend easily with light gray cabinets. Beautiful white granite can have complex designs and colors. Alaska white granite can add complexity and depth to a white kitchen. 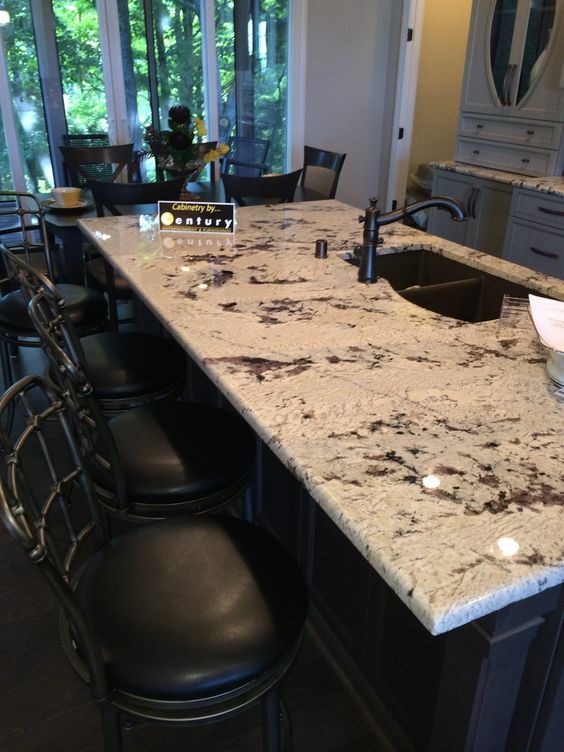 Alaska white granite can highlight darker kitchen elements, such as cabinets and stools. 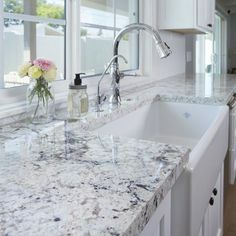 Each Alaska white granite countertop has a unique pattern. White is the most common color pairing for Alaska white granite. 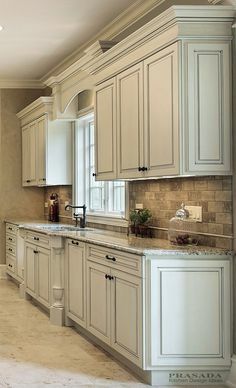 Smaller cabinets can utilize leftover granite tops as well. 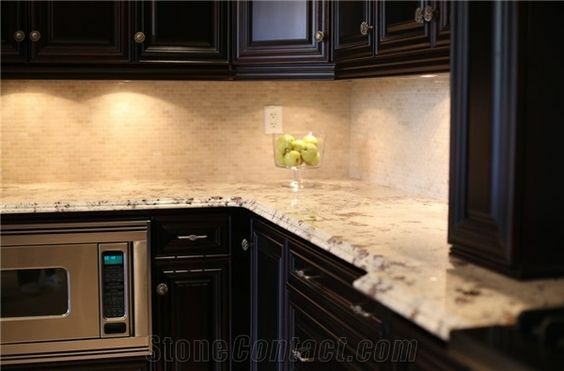 White granite can lighten up the look of dark cabinets for a modern feel. Each granite slab has a unique color profile. Alaska granite can come in gray and brown tones.